An act such as A World Extinct, had some history in their past. But the present and future look bright, as a line-up was put into effect, as they wrote material towards what is their latest offering, an EP titled "Theodicy". At first glance, your immediate reaction upon said material, is very familiar to other acts, who have taken a liking to the metalcore genre as these guys have done as well. Think of acts ranging from Killswitch Engage, All That Remains, or even other acts like Atreyu, Bullet for my Valentine or even Unearth. 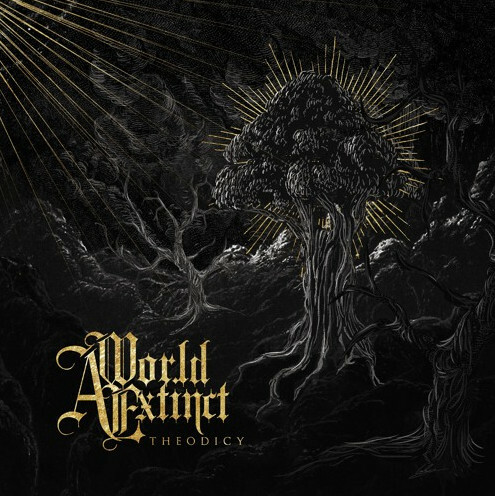 That is whom, A World Extinct sound a lot like, within this EP "Theodicy". The energy provided is really all over the place. You got some of the catchiest material available, ranging from breakdowns, solos, melodies, to even some slow more melodic if not mellower pieces like the track "Castles In Air" or "Weightless". "The Hunter And I", "Bridge Burner", and "Words Of A Wanderer", are likely the more "in your face" type of material offered off this EP. It hits you with that rush of fast hitting tones that grip on never letting go. It's how this EP plays itself out really. It has the low points of mellowness with the high points of heaviness, going in-between them as the play through occurs. Nevertheless, A World Extinct's works is expanding, into further regions of the music scene, thanks to this EP called "Theodicy".